Here is the latest print from the Elegy series. 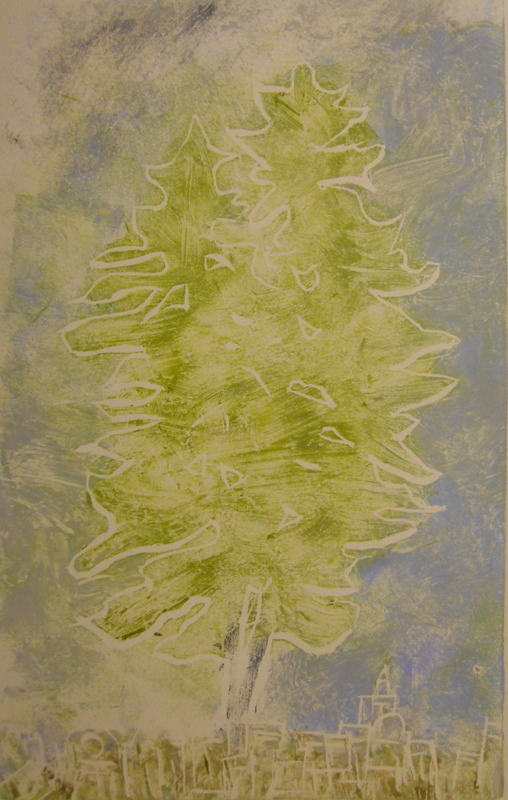 I made this by tracing the actual tree/photograph, editing/ simplifying quite a bit, and using transfer paper to transfer the design to the Speedball speedy cut plate. The first concern that I saw immediately was that the design on my original tracing was more interesting, almost ornate, and I feel it’s oversimplified here. The 2nd concern is that what I thought was a problem on the 1st plate (not including the smaller, test plate) the white/ uninked areas where I had carved away inside the tree, is actually graphically interesting and I can use more of that here. On Monday I am taking a monotype class with the amazing Pam Lawson, whose work with rollers is just incredible. Take a look at one of her red-winged blackbirds. And I’m thinking about signing up for a web design workshop at the Danforth Museum with the inimitable Jeanne Williamson. It’s called “Creating a Web Presence and Making the Most of It.” This would be great because Jeanne is one of the most professional artists I know, from a marketing standpoint. She simply does the best job of managing her web presence that I’ve seen. I just saw a few of her pieces in the “Cotton” show at Fountain Street Art, and since she showed her work in the Owen Shuman Gallery here in Groton, she has continued to find new approaches to her material, working in 3 dimensions, deconstructing the material into lacy tatters, etc. I never get bored of seeing what she does with it, and it’s a real lesson for artists who are trying to build a cohesive body of work to just look at hers. It takes a real single minded dedication to a subject. I spend a lot of time looking at other artist’s websites. This is excellent for keeping one’s ego in check. Do you have any idea how many awesome artists there are in the New England area alone? Just here, in Massachusetts. It’s astounding, it really is. I think we may well look back on this period in time as a Golden Age, from a creative standpoint. Seriously.